Just a day before Election Day, the painful reality hit home for Jimmy Carter: He was toast. As recalled in Dominic Sandbrook’s excellent history of the late 1970s, Mad as Hell: The Crisis of the 1970s and the Rise of the Populist Right, President Carter’s chances for a second term — despite the Iran hostage crisis, a lousy economy and terrible approval ratings — were apparently alive and well until the final days of the 1980 campaign. Going into the final weekend of the campaign, Sandbrook writes, Gallup had Carter’s Republican opponent, Ronald Reagan, up three points. Harris had him up five points, while Newsweek and The Washington Post had Carter up one. With Carter captaining the Democratic ship, election night in 1980 was Titanic-esque. Democrats lost 12 Senate seats and 33 House seats. Comparing 2012 to 1980, especially down the ticket, is perilous. Going into that election, Democrats had total ownership of the federal government, with comfortable control of the House and Senate along with the presidency. Today, Republicans control the House, while Democrats control the presidency and the Senate. Given the divided control of the government, some commentators we respect have noted the possibility of a total switcheroo in Washington next year: President Obama loses the presidency, the Republicans take the Senate and the Democrats re-take the House. That, of course, is possible. But it would be a first in the modern history of the republic: Since 1860, an incumbent president has never lost the White House in the same election that his party won control of either house of Congress from the other party. Similarly, the House and the Senate flipping in opposite directions has never happened in the same election in the same timeframe. In other words, regardless of what happens in the presidential race, a scenario in which Democrats captured the House next year and Republicans captured the Senate would be, in a word, historic. So history tells us that Democrats need Obama to roar back and win a second term in order to flip the House. And even that might not be enough. Maybe we’re headed not for another 1980, but another 1992. Like 1980 (and now), the country was in a funk, and voters took out their ire on the incumbent president, George H.W. Bush. However, Republicans netted a 10-seat gain in the House, thanks in part to redistricting and changing regional politics (the Democrats retained the House but then lost it in the 1994 GOP wave). If Obama gets Carter-ized next year — or Bush-ized — Democrats, like the GOP 20 years ago, might still pick up a few seats. But almost assuredly not 25. 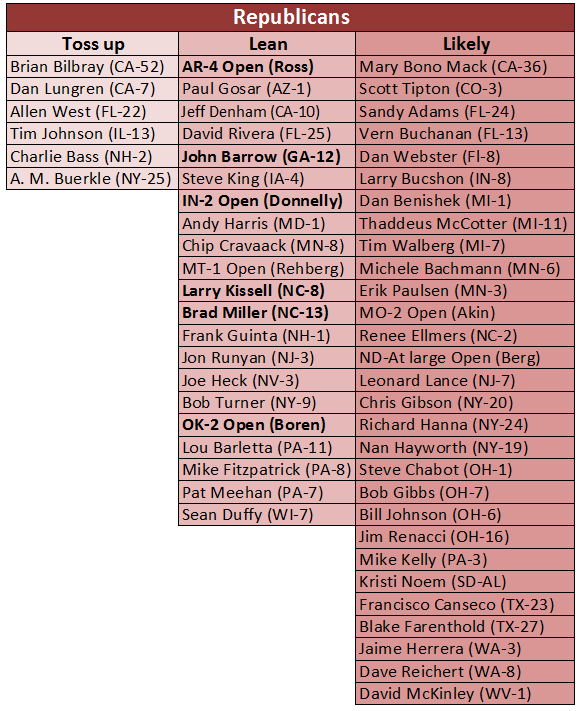 Analysis of the evolving House 2012 House map follows Chart 1. Notes: Bold type indicates that the current party that holds the seat is not favored to keep it. If redistricting has been completed in a state — the California seats are a good example — incumbents have been matched to the district in which they plan to run, which in many cases is a different number than their current seat. With Democrats’ deflating though perhaps not terribly meaningful loss in the New York Ninth District special House election two weeks ago, the balance of power in the House right now is 242 Republicans to 192 Democrats, with one vacancy: Former Rep. David Wu’s (D-OR) seat will be filled in a special election in January. That means Democrats need to capture 25 seats to win the House next November, provided they hold on to Wu’s old seat. Meanwhile, the redistricting dominoes continue to fall, and though Democrats have made advances in some places, Republicans are doing their best to cast their 2010 gains in iron. Three Midwestern states provide good examples. Ohio recently completed its redistricting plan, and Republican legislators there, as expected, solidified their 2010 gains. The new map is likely to be 12-4 Republican, and vulnerable Republican incumbents such as Reps. Steve Stivers and Steve Chabot now occupy districts that John McCain would have won in 2008 — they were in Obama districts previously. Potentially vulnerable is Rep. Jim Renacci (R), whose district was dramatically redrawn but is McCain, not Obama, territory. Rep. Betty Sutton (D), who lost her district, could take one for the team and challenge Renacci. Michigan Republicans, as expected, also slightly shored up some of their Republican incumbents, such as freshman Rep. Dan Benishek and Rep. Thaddeus McCotter, who just ended his quixotic presidential bid. An ex-rep, Democrat Mark Schauer, was drawn out of his old district, meaning that he won’t run against Republican Rep. Tim Walberg, whose district is also now slightly more Republican. And in Wisconsin, that seething cauldron of recent political warfare, one of the nation’s most targeted freshmen House members, Rep. Sean Duffy of northwest Wisconsin, saw his district made more Republican. Rep. Paul Ryan, a GOP star, also got help; Democrats were making noise about scalping this top Republican, but he’s now less vulnerable to a challenge. This is not to say that all of these members can now suddenly sleepwalk to reelection. But in just these three states in 2010, Republicans picked up a total of nine House seats. Thanks at least in part to redistricting, Democrats aren’t favored to take any of them back at this point. The political waves that washed over the United States in the past three cycles have finally crashed onto the Pacific Coast, where a nonpartisan commission has created new congressional districts that should inject much more competition into California’s U.S. House races. To put the new competitiveness in the Golden State into perspective, keep this in mind: From 2002 to 2010, there were 265 regular House elections in California (53 races in five different elections). In that time, a party change happened 0.38% of the time (only one party switch all decade). As we sort through the newly competitive map created by an independent commission, at this point we expect 14 of the 53 seats — or about a quarter of them — to feature competitive races this year, based on this round of ratings. Readers will notice that the bulk of the competitive California races are listed in the Democratic column. If things break right for the Democrats they could net about a fifth of the seats they would need to win back the House majority (five) in a single state. But there’s a whole lot that needs to be sorted out in California between now and November 2012 — including some nasty potential intraparty primaries that we don’t even have listed on our chart because the seats otherwise appear safe for one party or the other. One other note: California now has a primary system in which there are not separate party primaries; instead, the top-two primary finishers square off in the general election, no matter the party. Several major states still have to complete redistricting, such as Arizona, Colorado, Florida, Minnesota, New Jersey, New York, Pennsylvania, Virginia and Washington. These states have a combined 129 House seats. Republicans have total control of the process in Pennsylvania, which is losing one seat. Expect Republicans there to eliminate a seat and otherwise shore up their vulnerable incumbents, much like Republicans did in Ohio, Michigan and Wisconsin. Control of the governments of New York, Colorado, Virginia and Minnesota are split between Democrats and Republicans, so redistricting could end up being decided by courts. All are states where Democrats need to make gains if they are to win back the House. Arizona, New Jersey and Washington are all redistricted via some kind of ostensibly nonpartisan commission; Republicans control redistricting in Florida, but they are constrained by a recently passed constitutional amendment that prevents districts from being drawn to favor one party or the other. There’s no way that that amendment could lead to a lawsuit, right? Even though redistricting seemingly has been completed in many states, it’s not guaranteed that the maps are final. In Illinois, where maps have seemingly been settled for months, some black Chicago House Democrats are now questioning the legality of the map. Their complaints might give aid to Illinois Republicans, who would love for the courts to intervene and force changes to the new map, which is gerrymandered to help Democrats. And in Texas, an aggressive map that would help Republicans could face its own legal challenges: President Obama’s Justice Department believes the map violates the Voting Rights Act, and it seems quite possible that Republicans overreached. That could potentially cost the GOP big-time: Texas is heavily gerrymandered to favor Republicans. In our House race ratings, we are assuming for now that the maps that have been completed will not be changed. But America’s lawyers — a group that includes nearly two of every five members of Congress — could force changes to the lines as the election approaches. 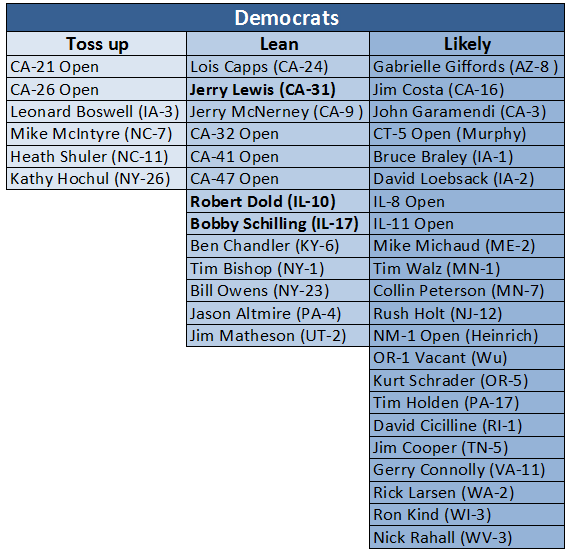 While the race for the House will come down to many important individual match-ups on a changed map, Obama’s performance is really the key to everything. If he does well, his fellow Democrats should have a decent chance to also do well. If he doesn’t, he’ll open perhaps not a bottomless pit underneath Democratic candidates, but maybe a sinkhole. In any event, the Democrats’ success, or failure, next year cannot be separated from that of their standard-bearer, the president.